Quite unlike Gaudí´s other famous achievements, Park Güell is not a building but the support structures required for a residential community: streets, walls, gate houses, a market place and a plaza. What it does have in common with some of the other constructions by Gaudí is that it was commissioned by the architect´s number one client, Eusebi Güell. 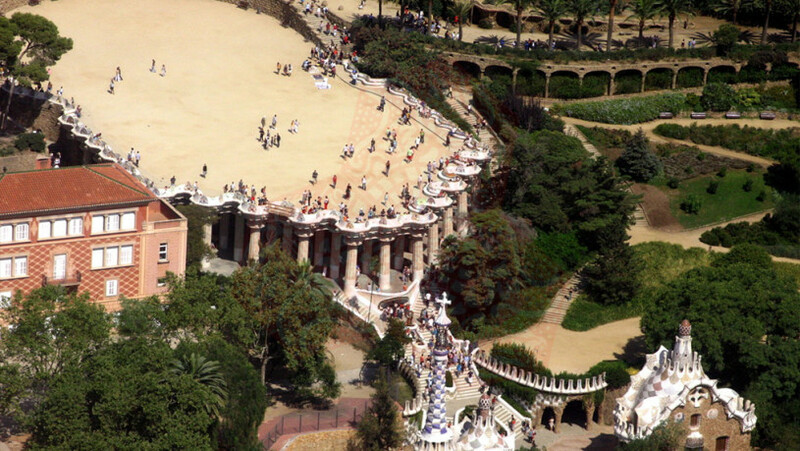 For all of its visual appeal or, at least, interest, Park Güell is the most difficult of the architect´s works to comprehend as it is not very clear what Güell and Gaudí were trying to achieve. One thing is obvious: the two men, possibly in collaboration with a few friends, decided to build a place that was private, that is, was meant mainly for themselves, not for the general public. It is filled with references to ideas, fantasies and ideals that were meaningful only to them. Unfortunately, they left no record of what they were planning. Thus, there is much that is beyond our comprehension and much which is open to interpretation, leading to different conclusions about the point of the community in general and the meaning behind many aspects of what was eventually built. Eusebi Güell had got one of those ideas in his head that filled him with enthusiasm and energy: establish a private residential community of great luxury on the outskirts of Barcelona. He dreamed of living together with his friends, making it possible to frequently hold long discussions with them in order to discuss Catalan artists and writers, Shakespeare and French dramatists and, above all, the important classical Greek philosophers, playwrights, historians, and the works of Homer. Greek tragedies would be presented for this elite group. To this end, he bought one of the hills that sticks out of the plain behind the city. It was called Muntanya Pelada (Bare Mountain) and was indeed a rocky, dry place with hardly a tree and mainly scrub bushes here and there—like most of the denuded hills that stood near Barcelona in the 19th century. The hill had been divided between two estates; Güell bought both of them, one of which included a large country house called, variously, Larrard House or Muntaner de Dalt House. The hill stood next to a neighborhood, La Salud, occupied by upper-class homes surrounded by walled gardens, in the town of Gracia (which was later absorbed by Barcelona). Covering an area of 15 hectares, the site enjoyed distinct advantages. It possessed abundant fresh air, spaciousness, the quiet of the countryside; it was, in other words, well away from the smokebelching factories, the crowds and the frantic activity that characterized the new industrial cities. It was blessed with a wonderful view of Barcelona and the Mediterranean beyond, as well as the charms of the irregular surface of the hillside. Its distance from mass transportation—it is still not the easiest place to reach today—insured considerable privacy. The advertising brochures stressed Park Güell’s beauty, the possibilities of recreation and of a healthy life style, the hygienic conditions, the infrastructure that was the best money could buy, the status acquired by living in the same community as E. Güell himself (Count of Güell by then) and his family, plus 24-hour security provided by a nearby rural police post (who occupied a building paid for by Güell). Because this residential or garden community was inspired by the ideas of English social reformers, the English word “park” was used in its name, rather than the Spanish “parque” or Catalan “parc”. The selection of the English term also provided an up-scale touch that would attract certain buyers. 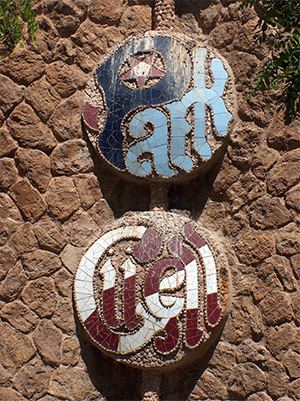 Like three of the projects Gaudí was involved in during his mature years, Park Güell is unfinished. The property was divided into 60 triangular lots, each one with enough space for a house. But only two houses were built, which, together with the Larrard House that already existed, made a grand total of three. Of the two that were built, one was the model to be shown to prospective buyers and the other one was sold to Martín Trías Domènech, a lawyer.